To purchase tickets visit nycitycenter.org or call 212-581-1212. Charlie Cox, Morgan Spector, Geneva Carr, and Heather Lind in Incognito. Photo by Joan Marcus. BOTTOM LINE: The stellar ensemble cast—including Geneva Carr and Charlie Cox—takes on multiple characters with ease in the multiple storylines of Nick Payne’s new neuroscience-themed play Incognito. British playwright Nick Payne has been making a name for himself in New York with star-driven productions, or more simply, Jake Gyllenhaal-driven productions. Gyllenhaaal starred in Payne’s last two New York mountings: If There Is I Haven’t Found It Yet and Constellations. Let’s be clear: Incognito does not star Jake Gyllenhaal. Much like Constellations, Incognito is not a traditionally told story, rotating through more than three different plotlines. The ensemble cast of four consists of Tony Award nominee Geneva Carr, Daredevil’s Charlie Cox, Heather Lind, and Morgan Spector, all of whom can hold their own in a battle of wits. Carr and Cox, in particular, are truly compelling in their distinctive characters for each story line, which they rotate through with ease. Payne’s dialogue is quick and clever, adding an unexpected humor to a play which is largely about science. 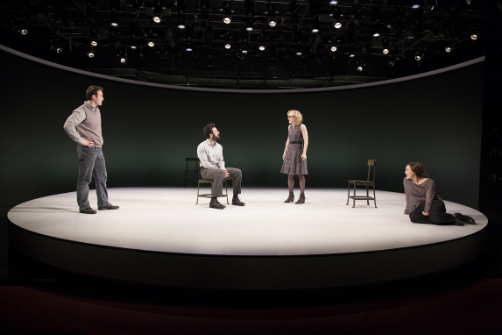 Designed by Scott Pask with lighting by Ben Stanton, the set is relatively simple, as the actors stand on a round platform in the center of the black stage, allowing the audience to focus on the people and the storytelling without distraction. Kudos are owed, as well, to director Doug Hughes, who ably separates each thread of story, allowing us to follow the action of the play without getting confused, in addition to keeping a steady and rapid pace. I wonder, though, if all this neuroscience really adds up to a satisfying story. It’s entertaining to watch as all four excellent actors fire on all cylinders (not to mention the extensive number of accents each of them have mastered), but I’m not sure what Payne wants us to take away. It’s certainly possible to tackle the larger intellectual themes that Payne is interested in (for example: string theory) and still come away with a satisfying emotional journey, as in the end of Constellations. But due to the nearly overwhelming number of characters, Incognito feels like an exercise more than a fully formed play. Despite my qualms about the play itself, an unsatisfying play by Nick Payne is still better than many other new plays; I just wish he wouldn’t rest so much on scientific chatter to do the dramatizing for him. Incognito is written by Nick Payne and directed by Doug Hughes. Movement is by Peter Pucci. Set Design is by Scott Pask. Costume Design is by Catherine Zuber. Lighting Design is by Ben Stanton. Sound Design and Original Music is by David Van Tieghem. Production Stage Manager is Catherine Lynch. The cast is Geneva Carr, Charlie Cox, Heather Lind, and Morgan Spector.